Think Luxury Suite on the 16th floor right next to the Marriott Hotel! Looking for your own little secret hideaway in the middle of a busy city? On business for a few months and looking for somewhere cosy to put your feet up at the end of a 'rushed off your feet' style day? This stunning south-facing property is located right in the heart of the city centre, only a stone's throw away from Glasgow's renowned shopping area - Argyle Street, Buchanan Street and Sauchiehall Street. The Hilton and Marriott Hotels are located right next door to the property and Anderston Station is only a short walk away. Should you wish to jump on the train to Edinburgh, Queen's Street Station is only a 15 minute walk from the property and Central Station is on the same street! There are also excellent bus links to the airport nearby. Glasgow's West End is about a 10-15 minute drive away and there you will find a vast array of bars and fine restaurants. Check out Ashton Lane for lots of quaint little bars, pubs and eateries. The University of Glasgow is also just off Byres Road (the main strip) and the Kelvinside Art Gallery, boasting Spanish baroque style architecture, is located on Argyle Street (West End side). Feel free to take a walk along the Clyde, which is steeped in history, or take a walk to the Charles Rennie Mackintosh tea rooms located on Buchanan Street. The Scottish Exhibition and Conference Centre (SECC) is also only a short distance away. 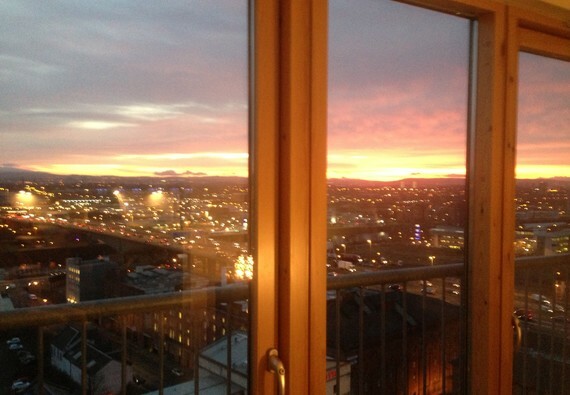 This two bedroom apartment is located on the 16th floor (top floor of the building) and there is lift access available. In total, there are two lifts in the building. Both bedrooms are fully furnished and equipped with two double beds. The living room/kitchen area is spacious and, besides the main bathroom, there is an en suite in the master bedroom. The large entrance hallway is very welcoming and bright, and carpets throughout means your stay will be cosy - you'll feel at home almost immediately! The property is furnished to a very high standard to ensure you have as comfortable a stay as possible. The property benefits from a concierge service between the hours of 10am to 6pm Mon-Fri. The property owner shall meet you at the apartment to provide you with a set of keys and the car park fob. Check-in time is between 4pm and 8pm, but we will always try to allow access earlier if requested, subject to availability. Should you require a later check-out, please let us know as soon as possible and we will do our best to accommodate. Views are a must-see from this property! Happy to accommodate for long-term stays (three months or more). Sleeping arrangements Double beds in both bedrooms. One single for set up in living room. Parking notes Underground car park with secure access and allocated space. Lovely apartment! Very nice and clean! Very central! Owners kindly came and met us with the keys! Would definetly recommend this apartment and stay here again! Delighted with everything. We always stay in hotels but I have changed my mind, this is more personal.